The moon and solar system’s largest planet, Jupiter, shine from dusk until well after midnight tonight. They will be very noticeable as the brightest objects in the night sky. After Jupiter and the waxing gibbous moon set in the west before Friday dawn tomorrow, look for the blazing planet Venus to rise in the east before dawn. The little star near it is Spica in the constellation VIrgo. The planet Saturn is now above Venus before dawn. Now, back to Jupiter in the evening sky. 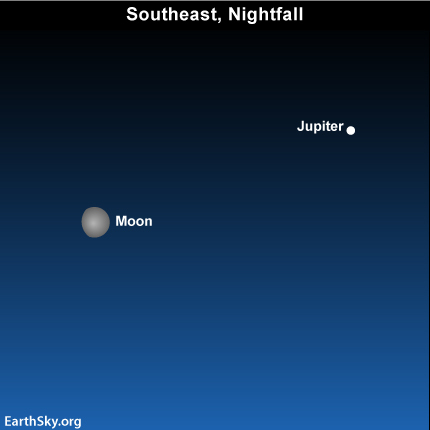 From this hemisphere, Jupiter will appear to the upper right of the moon Thursday evening. From the southern hemisphere, Jupiter will appear more directly above the moon. Either way, look for the brightest star like point of light in the evening sky, and that will be Jupiter! It so happens that today is a special day for Jupiter, because it marks the end of a four-month period in which the giant planet appeared to be moving westward in front of the stars. If you were to watch Jupiter over the course of its yearly appearance in our sky, you would find that this planet generally moves eastward among the stars, something that cannot be seen on a single night, but that is obvious over weeks and months. However, approximately every 13 months, Jupiter appears to go westward for about four months in what is called retrograde motion. In 2010, Jupiter’s retrograde – westward – motion started on July 24, and it ends today. This is not a real motion. Jupiter doesn’t really reverse direction, of course. Instead, it is an apparent motion caused by orbital geometry. In other words, it happens when our Earth and Jupiter – moving in their respective orbits around the sun – align just so. It is like what happens when you in your fast car are passing a slower-moving car on the highway. The slow car can, for a time, appear to move backwards against the distant landscape. So, as seen from our faster-moving Earth, Jupiter at times appears to move backwards in front of the background stars. As the Earth rotates from west-to-east on its axis tonight, it’ll cause the moon, Jupiter and the stars to travel westward across the sky – just like it causes the sun to go westward during the day. Jupiter will set in the west after midnight, and then the moon will follow Jupiter beneath the horizon before dawn. As the moon sets in the west tomorrow, the blazing planet Venus will rise in the east, to adorn the dawn and predawn hours.